By now you may have heard about the Dairy Industry’s petition to the FDA but if you haven’t, I thought I’d share what is going on (and what you can do about it). My Mother In-Law brought this to our attention two months ago and since then it has been all the buzz. So here is the story as I understand it. In order to comply with the new Dietary Food Guidelines, the Dairy Industry feels that they need to lower the calories in the flavored milk products that they sell in schools and in stores. In order to do this, they plan to switch out the sugar (or high fructose corn syrup) that is currently used and replace it with aspartame. By law they will be required to list the aspartame on the back label as one of the ingredients but will not have to declare on the front of the bottle that it is included. As it stands now, if they are to add aspartame to a milk product, they have to put a label on the front that said something like, “reduced calorie milk”. They feel these types of labels scare kids away from their products and so they are petitioning to not have to include them. 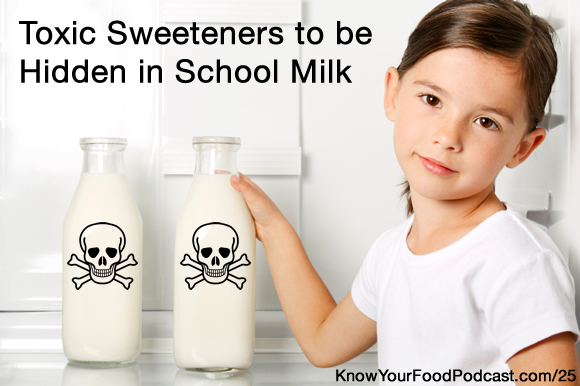 They want the kids to be consuming the carcinogenic diet beverages healthy milk and not know that the artificial sweetener is hidden inside. This petition will also allow them to put aspartame in 16 other household dairy products (yogurt, sour cream, low-fat milk etc.) without labeling the front. It will require all consumers to pay close attention to dairy labels to see if this is hidden in the product you consume. I myself can not digest aspartame, it first gives me horrible stomach pains and if I continue to consume it for extended periods of time I get migraine headaches. As a former diet soda addict, I’d suffer through the pain taking week-long breaks to recover just so I could get my diet soda kick. Aspartame is not fun stuff and it there are studies that say it is linked to obesity. So this movement to lower our kids calories in milk so that they will be less obese will actually be doing the opposite. We as consumers have until May to take a stand against this petition. You can start by following a few short steps below to make sure that this is not allowed. I have also include some additional resources for you to check out if you’d like more information. Let’s keep aspartame out of our kids milk!